Captain Hooks | The Kids Beat | Kids VT - small people, big ideas! Rockin' Ron the Friendly Pirate doesn't rest on his laurels. Following a debut album in 2010, Give Me an RRR!, and a DVD in 2012, Lights ... Camera ... 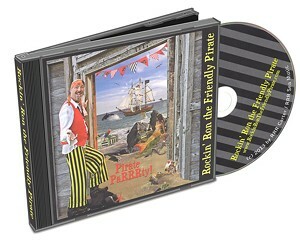 RRR!, Jeffersonville's most amiable, landlocked corsair is back with another collection of kid-friendly sea shanties, Pirate Parrrty! It's a treasure chest loaded with 20 original songs, running the gamut from upbeat, contemporary pop ("We RRR the Pirate People") to gentle lullabies ("Safe Harbors"). While the album's lengthy 47-minute runtime — not to mention the eye-rolling overuse of "RRR!" puns — may send seasick parents down the plank, their little scallywags will undoubtedly get a kick out of Ron's silly swashbuckling.